Amazon is known for its fast delivery times and reliability. I know when I place an order from the site, if it doesn't get here in the promised two days, that's because it got here in one instead. This has brought the online retailer widespread adoption, even if that hasn't necessary translated into huge profits. This has only encouraged Amazon to speed things up. We've heard talk of drones for a few years now. A more recent rumor has been that Amazon was planning on using everyday Americans to help with same-day delivery. You could call this the Uber approach. 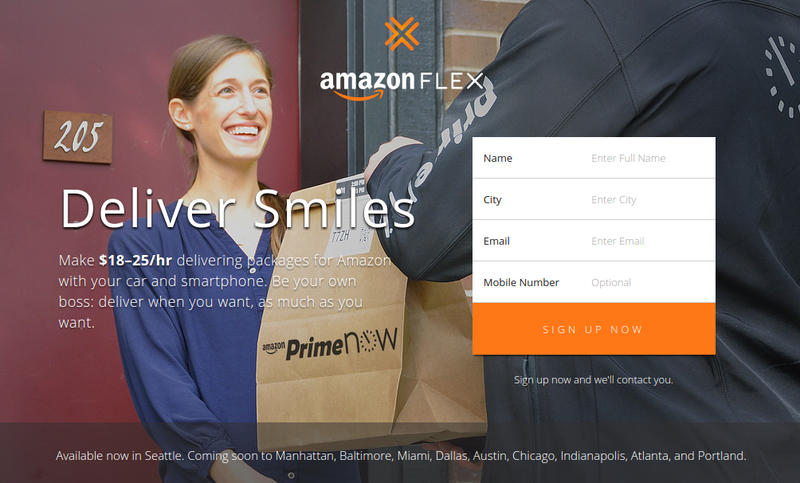 Now this experiment has a name: Amazon Flex. Amazon has started to recruit drivers in the Seattle area who will deliver Amazon Prime Now packages for $18-$25 an hour. These drivers have to provide their own car and Android phone, in addition to passing a background check. Drivers can choose to work two, four, or eight hour blocks on the same day, or set availability to work up to twelve hours in the future. Amazon Flex is starting in Seattle, but it should expand soon to Atlanta, Austin, Baltimore, Chicago, Dallas, Indianapolis, Miami, New York, and Portland.